Dental Implants are a permanent solution for the replacement of a single tooth, multiple teeth or all teeth. The material used for the fabrication of the Implants is Titanium which is highly biocompatible ( easily accepted by the body as being a part of the body without causing any reactions). For successful treatment outcome with dental implants, the bone quality should be optimum both in quality as well as the quantity. These root form dental implants get integrated with the bone. 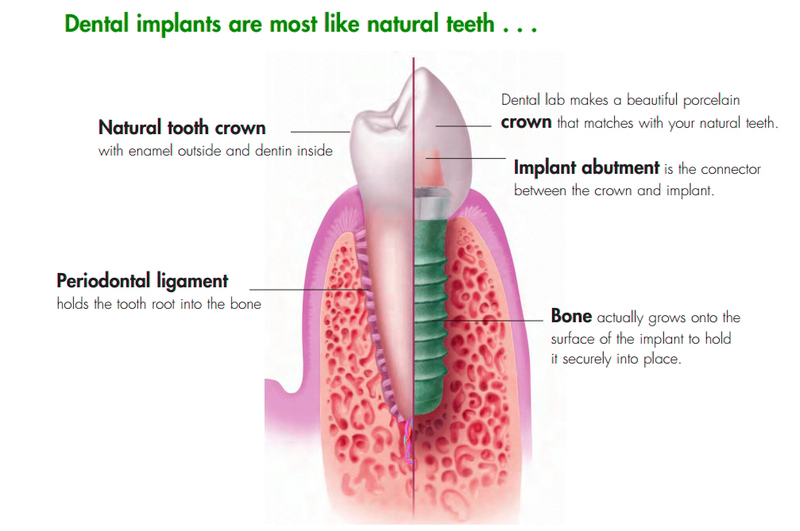 The implant device acts as a support for the crown or the ‘artificial tooth’. This is the basic concept of how Dental Implants work. All Dental Implants at Orion are placed by experienced Implantologists. 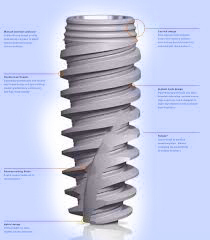 The Dental Implants used at Orion Dental are among the best dental implant systems used worldwide. They are made available to our patients at a fraction of the cost its available for in other parts of the world. Both partial, as well as full jaw replacements, are feasible using dental implants. Best way to getting the form function and aesthetics of a natural tooth at a fraction of the cost you would have to pay anywhere else in the world. 1) Unlike a dental bridge, Dental Implants do not require the grinding of adjacent teeth for support. 2) Dental Implants in Delhi, restores the ability to chew properly, thus allowing a healthy and complete diet. 3) It enables you to speak properly. 4) Dental implants in Delhi look and feel like your own teeth. 5) Many patients report that even though the cost of dental implants in Delhi is more than other forms of tooth replacement options, Dental Implants are more comfortable in long-term than other conventional techniques and are considered the best option for replacement of teeth as they end up saving more money in the long run. Patients having Heart Condition/ Diabetes / Other systemic disorders can also get Dental Implants done at Delhi @ Orion Dental care along with the approval of the concerned treating doctor after getting the clearance. Dr. Natalia is a trained Oral Medicine specialist is thus trained to handle patients with Systemic diseases. We also have an expert physician Dr. Narottam Bharadwaj on call for systemically compromised patients so that any complications can be anticipated and thereby well managed. Just as your own teeth require conscientious care and at-home oral care with regular dental visits, you will need the same with dental implants. Dental implants in Delhi are like your own teeth and will require the same care. Keep your implant clean and plaque-free, and for that brushing and flossing is necessary. After treatment, periodic follow-up visits will be scheduled to monitor your implant, teeth, and gums to make sure they are healthy. Immediate dental implants mean that the crowns can be restored within 48 hrs of the dental implant placement. This means that you can eat and smile immediately after the treatment. The Dental Implants used at Orion Dental are designed to provide good primary stability, which is suitable and desired for immediate loading cases. This makes implant treatment very similar to general crown & bridge restorations. Dental Implants in Delhi Used in Orion Dental Care is tissue friendly. Step 1 – Involves the placement of the Dental Implant into the patient’s mouth so that we can lay the foundation for the tooth to be restored. Step 2 – Involves the attachment of the crown to the dental implant. This may be done within 48 hours or 3 months after implant placement. Immediate Function makes it easy for both patients and dentists: Implants become a natural adjunct to teeth and the patients get immediately restored teeth – and immediate quality of life. The Immediate Function procedure with implants is clinically proven and the success rates are similar to those of conventional implant protocols. The results from these studies show that Immediate Function is possible in all oral regions. The result is that the patient leaves the chair with teeth in place after a short and non-traumatic surgery with a minimum of post-operative reactions (after the dental implants Delhi). This new modality provides enhanced patient satisfaction and simplifies the work of the treatment team. Less Discomfort: Patients experience minimal discomfort, especially during a flapless procedure which can be used during the placement of the Dental Implants Delhi. Reduced Chair time: The one-stage surgical procedure reduces chair time, saving the patient time, expense and discomfort. Immediate Function: An aesthetic restoration can be achieved immediately, providing patients with immediate gratification. Reduced Bone Loss: The Osseo conductive implant surface and the immediate function protocol reduce potential bone loss at the alveolar crest. All dental implants in Delhi at ORION DENTAL CARE CENTRE, GK-1, New Delhi are placed under strict standards of hygiene and sterilization. The best dental implants are used which are safe and comfortable. For providing better support to our patients our team of doctors is available 24 hours a day on call for meeting emergency dental requirements of our patients. We understand our patient’s concerns about the Cost of Dental Implants Delhi, and for this, we offer multiple payment options. Some of the options are cash, cheque, credit card and part payment as the treatment progresses.